The Mount Dawei National Forest Park is located on Mount Dawei in Liuyang County, 136 kilometers from Changsha, capital of Hunan Province. The park is 180 square kilometers in circumference, and the core scenic zone occupies an area of 38 square kilometer. It boasts fantastic mountains, beautiful waters, deep and quiet forests and weird rocks. 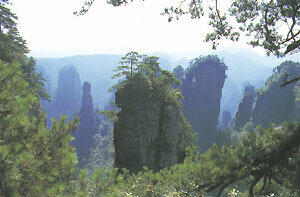 Its highest peak, on the Seven-Star Range, is 1,607.9 meters above sea level and is also the highest spot around Changsha. 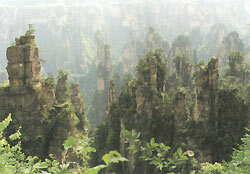 Due to its high elevation the vegetation is distributed vertically. On the mountaintop there is a rage grassland with an area of more than 20,000 mu, and alpine azaleas, which cover an area of 30,000 mu. The grassland is dolled with 13 alpine lakes, and the three-step Maweicao waterfall, with a total drop of 140-some meters. As the mountain is so high and the forest so dense, it is very cool in summer in the forest	park, with an average temperature of 23.9C in August, the temperature on the mountaintop being 15C lower than that at the foot of the Mountain.